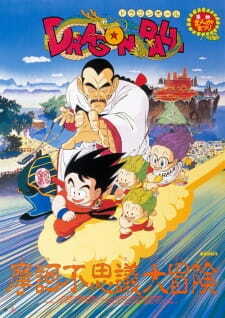 Another Dragon Ball film. Another retelling. This one combines the first and second tournament arc with the Red Ribbon arc. Then it tells it completely differently. For the curious only. Animation seems a bit sloppy here and there. Certain facial expressions used by our beloved characters don't really match them. Bulma is just all over the place. Everything else just seems like a step down from the anime. It works, but you'll notice it as well. The English voice actors are different from the anime. A few remain the same, but big ones like Goku are wrong. They will annoy you. Goku's voice just lacks conviction. But the music is all fitting. So at least we have that. The story is out of control. It starts with Roshi finishing the training of Goku and Krillin. From there they head to the tournament. But Chiaotzu and Tien are around. For some reason Chiaotzu is a ruler of an empire. It's weird. Tien and Chaiotzu are nothing like their anime counterparts. Then throw in some Red Ribbon Army. A hefty dose of Master Shen. Then you have the show. It's sounds like a mess, but if you look at it as it's own thing it works. Do you need to watch this? No. Do I even recommend it? Not really. If you are a fan of Dragon Ball and are curious then go for it. It's not going to make your experience that much better or worse.